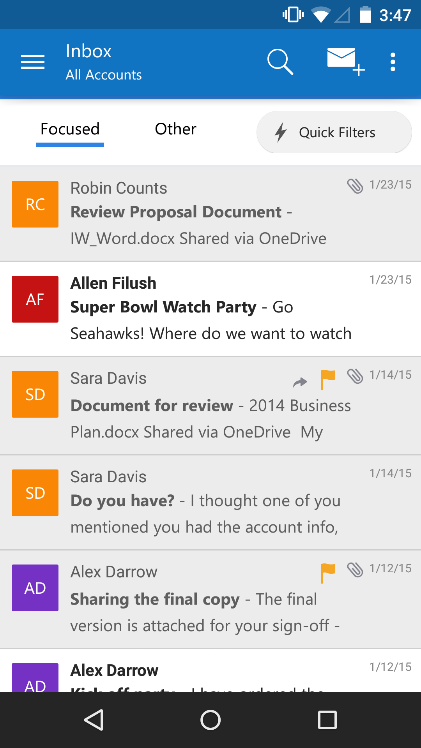 Today, we announced the release of Outlook for iOS and a preview of Outlook for Android. If you have an iPhone, iPad, Android phone or Android tablet, chances are that you’re using the built-in email and calendaring capabilities of your device. Why use the new Outlook app instead? We’re glad you asked! Despite the smartphone becoming a primary screen for reading email, most of us perform only basic email triage on the phone, delaying the rest to deal with on the computer. Activities like sorting through large amounts of email, managing your calendar, and sharing files require too many steps or multiple apps that don’t work together well on the phone. The new Outlook app brings together the core tools you need to get things done—your email, calendar, contacts and files—helping you get more done even on the smallest screen. Email overload is the new norm. That’s why Outlook helps you focus on what is most important and clear out the rest. 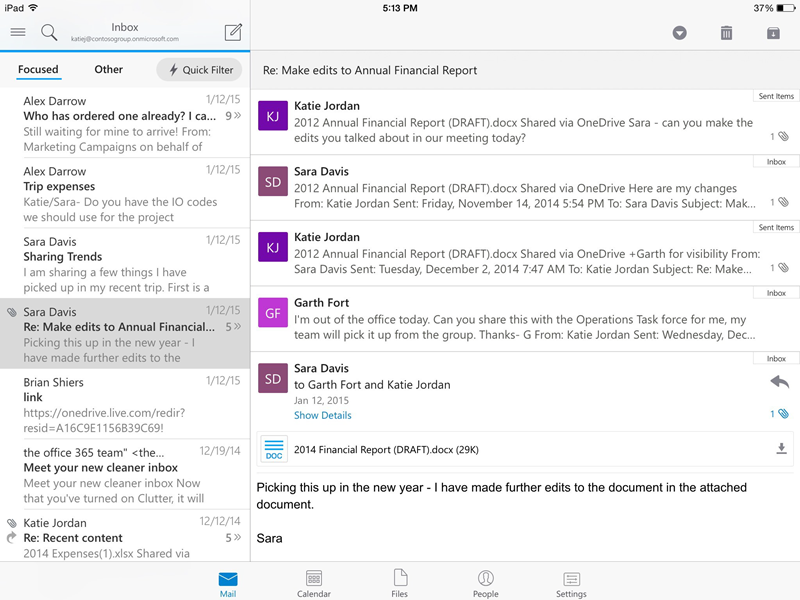 The new Outlook app separates your mail into two tabs—Focused and Other. Important emails appear in your Focused Inbox, while the rest remain easily accessible—but out of the way. If you move email in or out of your Focused Inbox, Outlook learns this about you and gets even more tailored to your priorities. Are you no longer reading that newsletter you signed up for? Outlook has a one-click unsubscribe to help you stop unwanted mail. The Focused Inbox works across all of your email accounts to help you focus on what matters. With Outlook’s customizable swipe gestures, rapid email triage is literally a one-touch experience. You can swipe right or left to take actions like archive, delete, move, flag, mark as read/unread or schedule. 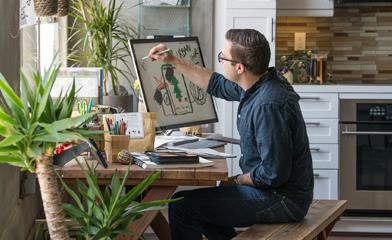 Unlike other email apps, Outlook lets you personalize these swipe gestures to match your unique email habits. For email that you want to handle later, the ‘Schedule Email’ feature temporarily removes email from your inbox, to return at the time you choose. Schedule messages to temporarily leave your inbox and return at the time you choose. Finding important emails is now lightning fast. Outlook’s predictive search quickly finds the right emails, people and files as you type just a few letters. Outlook also lets you pivot on People, so you can see the people you email with most often and easily find all the emails, meetings and files shared with those people. lets you conveniently drill down to see all related emails, meetings and shared files. Best of all, these features work across your favorite email accounts, including Office 365, Exchange, Outlook.com, iCloud, Gmail and Yahoo! Mail. Need to schedule a meeting? No sweat! Most email apps completely ignore your calendar or have a minimal level of integration. In Outlook, your calendars are available right within the app, allowing direct interaction with your email, including features like viewing meeting details, invitees and their attendance status. The ‘Quick RSVP’ feature lets you respond to meetings (Accept / Tentative / Decline) right from your inbox, without even opening the mail. 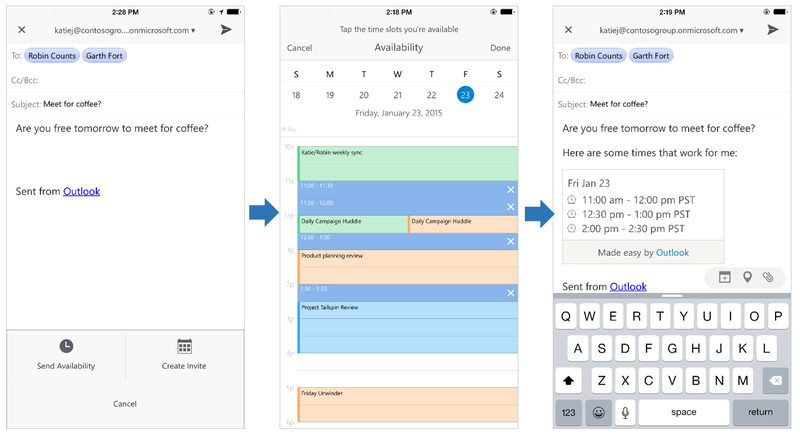 What really sets Outlook apart is how it helps you manage your calendar on the go. The ‘Send Availability’ feature lets you find and share available meeting times in email with ease. Once you’ve settled on a time, you can even create a meeting invitation—all handled without leaving the app. With a few clicks, you can highlight available times on your calendar and insert a list into the body of your email. People are catching on to the benefits of cloud storage, including the ability to work together on a single document. But when working in email on a mobile device, it can be difficult to add links to cloud documents and give recipients permission to view the files. As a result, people often wait to get back to their computers before sharing documents, or stay in the habit of sending traditional attachments. Insert a link to file in the body of your email. Recipients automatically are permissioned to view the file. Outlook makes it simple to share files stored in the cloud. 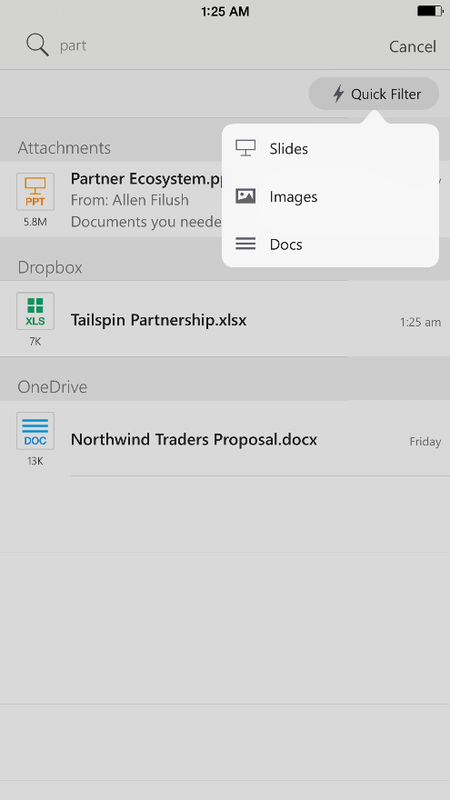 With just a few taps, you can insert a link to any file from OneDrive, Dropbox and other popular accounts in your email message. Recipients are automatically granted permission to view these files, with no extra steps. Quickly find that document you need with universal search and quick filters to sort by file type. Need to find a file quickly? No problem. Outlook provides a view of your recently received email attachments, so you don’t have to go searching through email to find that document you need. Outlook also lets you search across both your cloud storage and your email attachments at once, with Quick Filters to let you quickly sort by file type. The Outlook app feels natural on both iOS and Android. For example, on iOS, you will notice familiar icons and actions for creating new messages, identifying new mail and taking actions like archive and delete. On Android, we use the Navigation Drawer to house the multiple tools offered in the app and have common actions like settings available in the App Overflow menu. Outlook was built with the unique design principles of iOS and Android in mind. 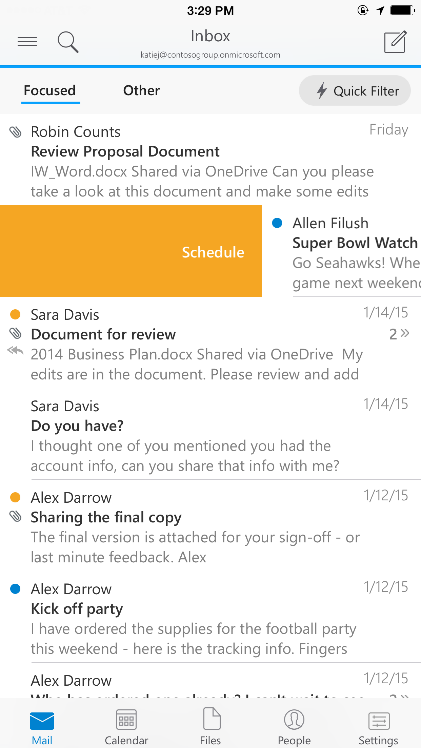 Across both iOS and Android, the Outlook app works great on phone or tablet. For both the iPad and larger Android devices, additional screen size is used to unlock additional views like a two paned email list, week view in calendar and the ability to see a preview of your files. Outlook is adaptive to fit the device you are using, especially larger devices like the iPad and Android tablets. 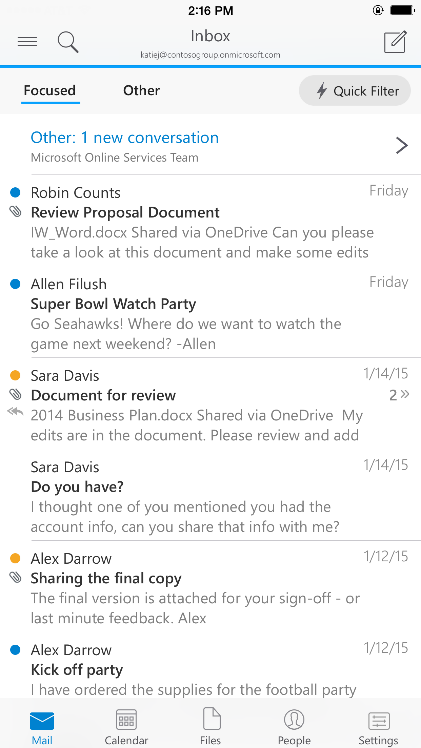 We’ve examined a few of the ways that Outlook helps you get more done on a phone or tablet. To try out these features and see even more of what the app can do, download it from the iOS App Store and Google Play. We will be iterating quickly to bring new features to Outlook, shipping new versions of the app every few weeks. We’ll add user-focused features that help you get even more done while on the go, and we’ll also expand the capabilities that matter to IT, such as mobile device management. Have a feature request? Let us know right from Outlook by navigating to Settings > Help > Contact Support or by commenting below. Give the Outlook app try and let us know what you think! Editor’s note: Due to the interest in Outlook and the volume of comments we’ve received below, we are hosting a YamJam on February 4th at 9am PST in the Office 365 Yammer Network. The Outlook product team will be there to discuss topics like app architecture, security, and administrative controls. If you can’t join us for the YamJam, there’s some good content on these topics posted at the same link. See you there! Q. Which accounts can Outlook connect to? A. Outlook can sync mail, contacts, calendar and files from Office 365, Exchange Online, Exchange Server (2007 SP2, 2010, 2013), Outlook.com (including Hotmail, Live, and MSN), Gmail, iCloud and Yahoo! Mail. For cloud storage, Outlook connects to OneDrive, Dropbox, iCloud, Google Drive and Box. 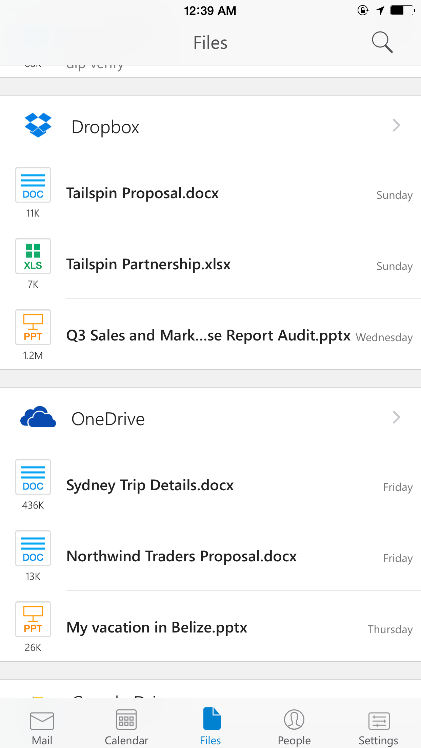 We will be updating Outlook to connect to OneDrive for Business. Q. What markets and languages will Outlook be available in? A. Outlook is available in all markets supported by the iOS App Store and Google Play Store. Users in any of these markets will be able to download Outlook. The Outlook user interface is translated in 30 languages: English, Norwegian (Bokmål), Catalan, Croatian, Czech, Danish, Dutch, Finnish, French, German, Greek, Hungarian, Indonesian, Italian, Japanese, Korean, Malay, Polish, Portuguese, Romanian, Russian, Simplified Chinese, Slovak, Spanish, Swedish, Thai, Traditional Chinese, Turkish, Ukrainian and Vietnamese. Q. What versions of iOS and Android are supported? A. Outlook can run on iOS 8.0+ and Android 4.0 and above. Q. Why is the app called “Outlook Preview” on Android? A. The iOS version of Outlook is ahead of the Android version in terms of features and performance. Once we have completed sufficient work on Android to close the gap we will remove the Preview label. Q. What happens to the current Outlook Web Access (OWA) for iPhone/iPad/Android apps? A. 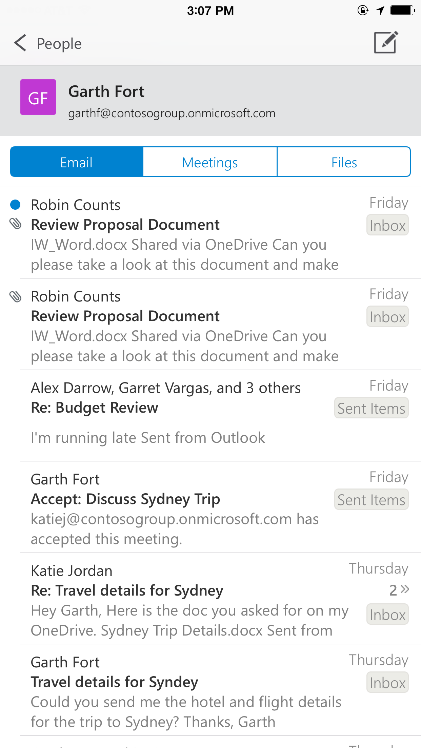 The new Outlook app replaces OWA for iPhone/iPad/Android. We are leaving the OWA for iPhone/iPad/Android apps in market for the time being because there are some advanced Office 365 and Exchange Server features that are not yet available in Outlook. Customers who require these advanced features (e.g. viewing Information Rights Management protected mails, support for Apps for Outlook) can continue to use OWA for iPhone/iPad/Android until those features are available in Outlook. Q. Does the new Outlook app work with Outlook.com? A. Yes, we encourage Outlook.com users with iOS and Android devices to download and use the app. Outlook replaces the previous Outlook.com Android app.